You need to cook dinner for your family but you don’t have much fresh ingredients left in the fridge anymore. I understand. It happens to the best of us. After cooking for a while (and being too busy to take a trip to the supermarket), I have developed a repertoire of ‘last minute dishes’. They are made from all the things I normally have in the kitchen at all time. 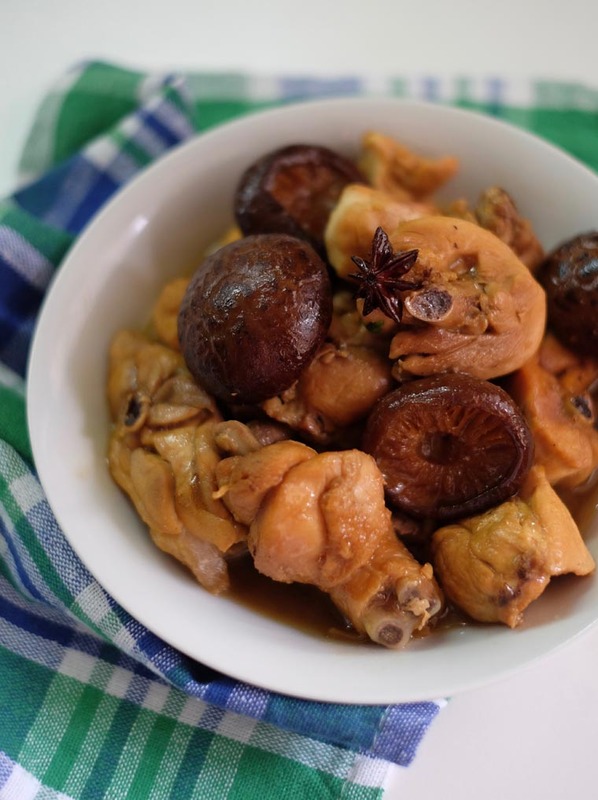 One of the recipes is soy braised chicken with mushrooms. It’s the perfect dish when you don’t have much fresh ingredients left. If you have frozen chicken in the freezer, you are probably good to go. 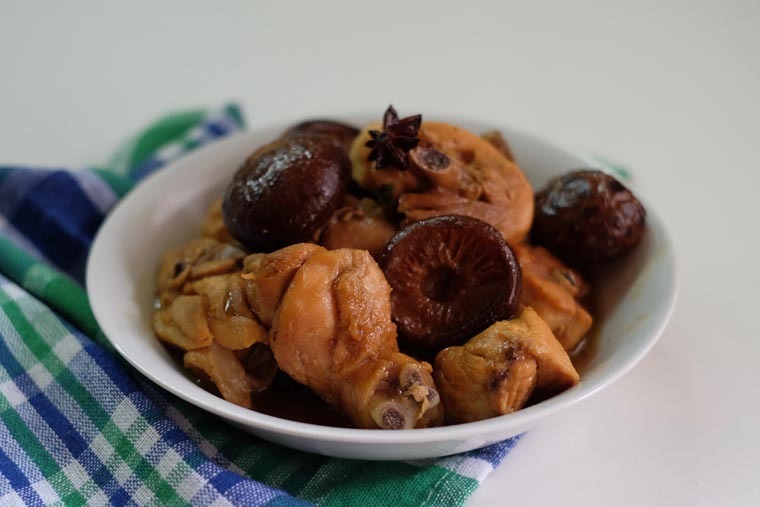 You will need ginger and dried mushrooms; two long shelf-life ingredients that I always have at home (even if you don’t have them, you can still cook this dish). 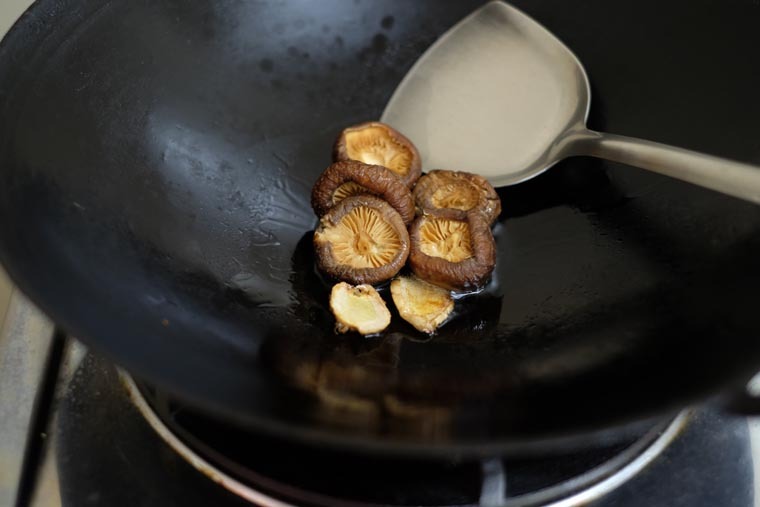 Simply fry the ginger and mushrooms in oil until aromatic. 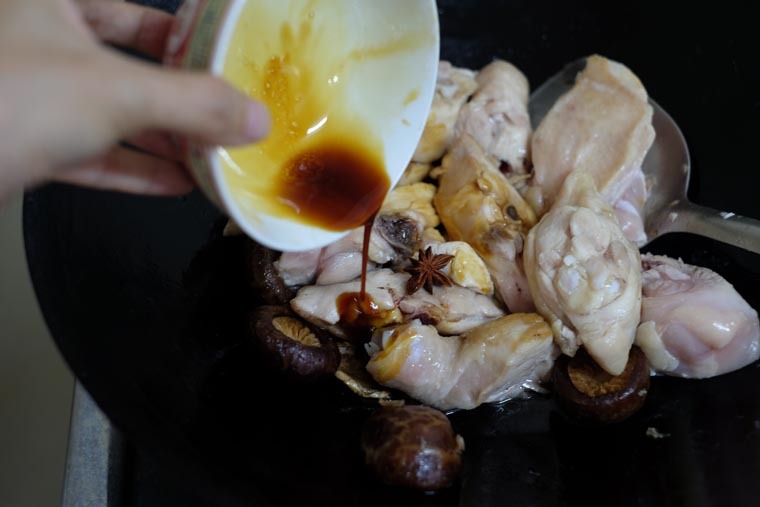 Then braised the browned chicken in a mixture of seasonings and spices: soy sauce, oyster sauce, shaoxing wine, sugar, and star anise. 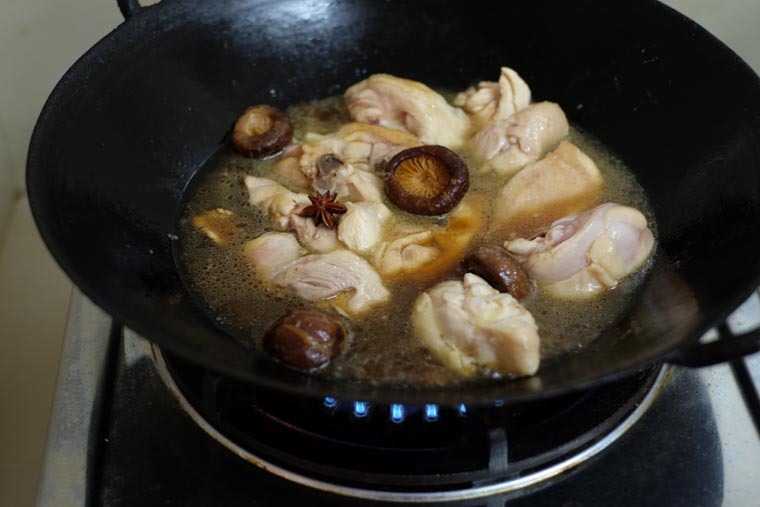 Let it slowly cook in the wok until all the flavour is infused into the chicken and mushrooms, and the mixture thickens into thick and tasty sauce. Step 1 PREP: Soak mushrooms (reserve the water for cooking). Slice ginger. Clean chicken throughly. In a bowl, add in all seasonings. 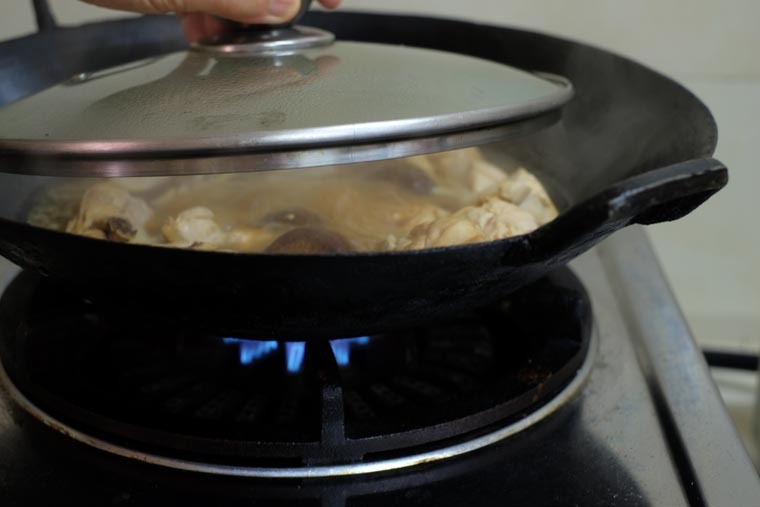 Step 2 FRY GINGER & MUSHROOM: Pour in 2 tbsp of cooking oil in a heated wok. Stir-fry ginger and mushroom in medium-high fire until fragrant (1 min). Step 3 FRY CHICKEN: Add chicken and fry until golden brown. Step 4 POUR IN SEASONINGS & WATER: Pour in seasonings and enough water to cover the chicken (about 1 cup). Bring to a boil. Step 5 BRAISE: Cover and simmer over low heat until chicken is cooked through and most water evaporates (about 1 hour). Fry 2 slices of ginger + 5 sliced mushrooms in 2 tbsp of oil. Fry 1/2 chicken pieces. 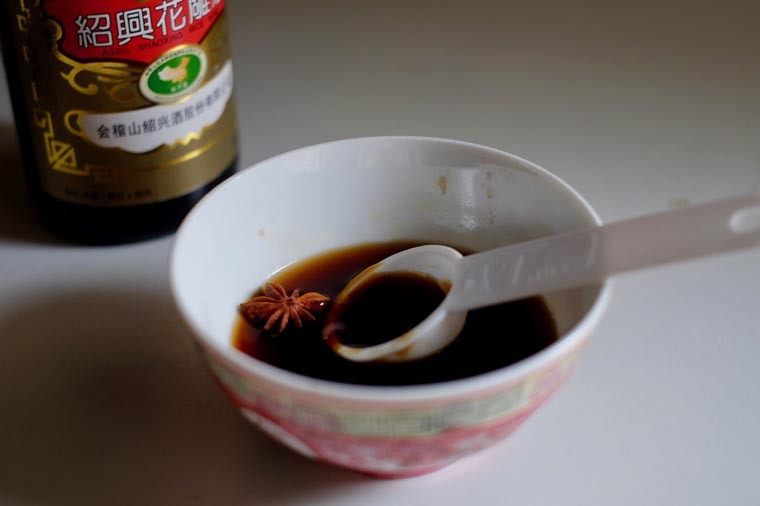 Pour in seasonings: 1 star anise + 1 tbsp light soy sauce + 1.5 tbsp oyster sauce + 1 tsp dark soy sauce + 0.5 tbsp Shaoxing wine + 1 tsp sugar. Add enough water to cover the chicken. Bring to a boil and simmer over low heat until water evaporates. 1. PREP: Soak mushrooms (reserve the water for cooking). Slice ginger. Clean chicken throughly. In a bowl, add in all seasonings. 2. 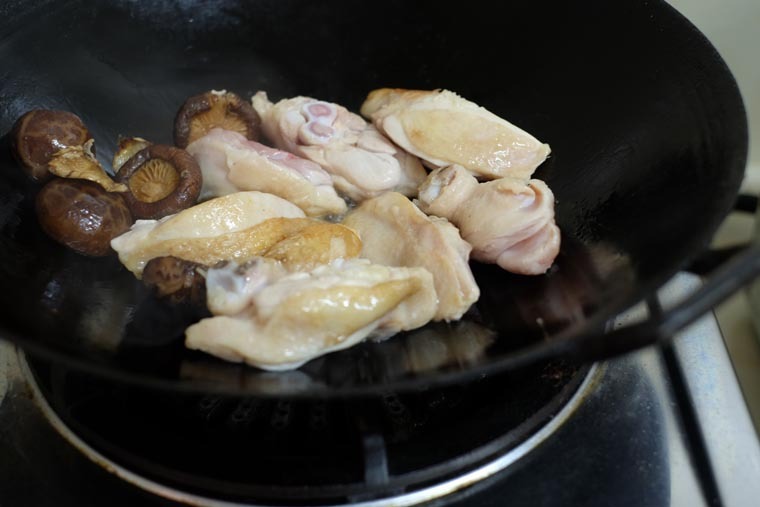 FRY GINGER & MUSHROOM: Pour in 2 tbsp of cooking oil in a heated wok. Stir-fry ginger and mushroom in medium-high fire until fragrant (1 min). 3. FRY CHICKEN: Add chicken and fry until golden brown. 4. POUR IN SEASONINGS & WATER: Pour in seasonings and enough water (from the water used to soak mushrooms) to cover the chicken (about one cup). Bring to a boil. 5. 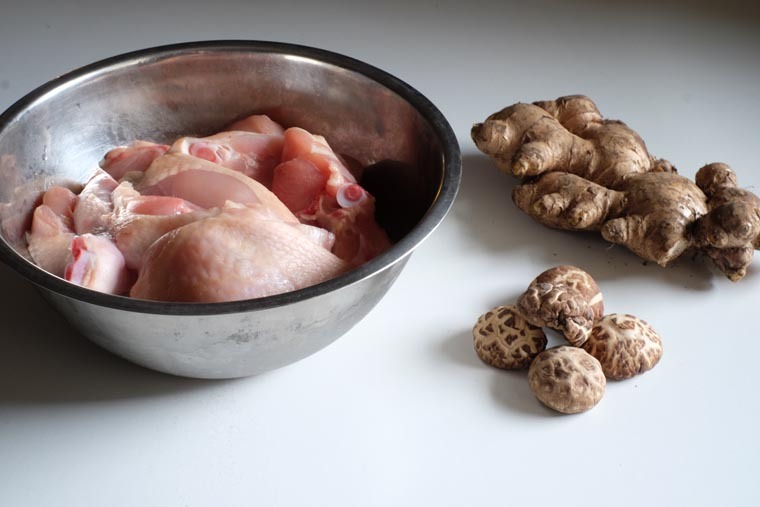 BRAISE: Cover and simmer over low heat until chicken is cooked through and sauce thickens. Adjust seasoning if necessary e.g more sugar if its too salty or more soy sauce if its not flavourful enough. Don’t peel ginger. 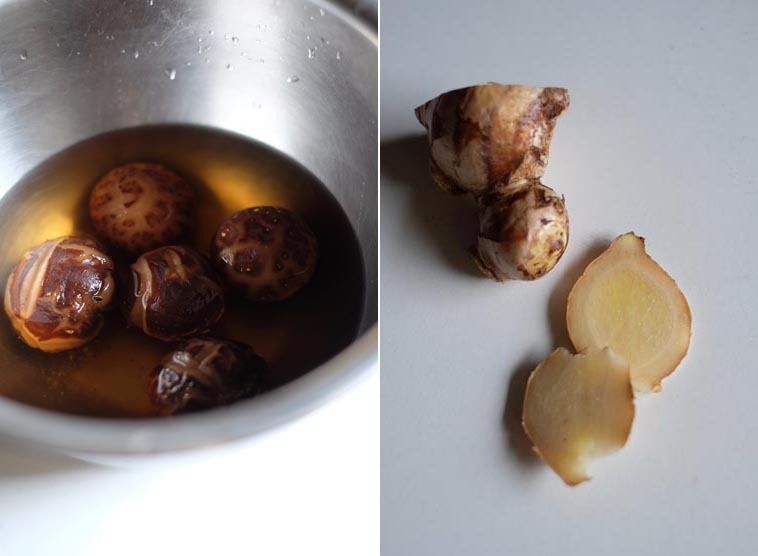 It’s not necessary to peel the skin of ginger if you’re using it for flavouring, not eating. Besides, the Chinese believe that ginger skin is ‘cooling’ and balances the ‘heaty’ flesh. Reserve the water used to soak mushrooms. The water used to soak the mushrooms contains umami-rich flavour. Don’t pour it away. Instead, add the flavourful water into the dish to make it even more delicious. Freeze soaked mushrooms. Depending on the thickness and size of the mushrooms, sometimes it takes hours to soften them. When you have time, soak more mushrooms than you need and freeze the rest. Soak mushrooms in hot water. If you want to use dry mushrooms quickly, soak them in hot water. They’ll reconstitute faster in hot water than in cold. When you have nothing much left in the kitchen next time, remember you can still make a delicious dish with a frozen chicken and common seasonings. Try it!